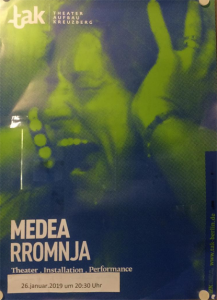 Medea moving across centuries, the story is timeless, current, ongoing. 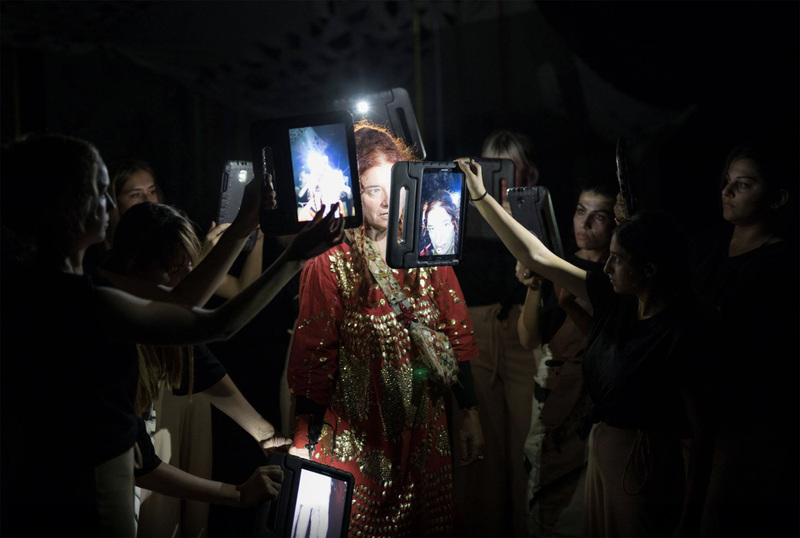 In this artistic interpretation Delaine Le Bas uses artwork, costume, text, current headlines and the internet to bring Medea into today. The chorus speaks out in multi lingual texts, singular voices as whispers as sounds, the cacophony of them together their voices lost amongst the ‘noise’ that can not tell their stories as individuals or hide their collective presence as a ‘swarm’. Medea’s story is now, happening at this moment in time not an historical myth. ‘The Jungle’ in Calais now demolished the language that accompanies it reminding us of colonialist attitudes with racist terminology splattered amongst so called ‘civilised’ language, with encampments in clear sight and in the spaces in between discovered, destroyed, remade. Medea’s situation is as potent today as it was when it was first written.